About 2 teaspoons of canola oil should be enough to coat one medium sweet potato cut into fries or wedges. Toss your oil and sweet potato pieces in a large bowl. Use your hands to mix them together to distribute the oil more effectively. This is also a good time to add seasoning, since the oil will help it stick evenly to the food. And while you're at it, a little oil or cooking spray on your... 30/07/2013�� Instructions. Cut the sweet potato into 1/4 inch thick fries. Pop them into a bowl of water for about an hour; Preheat your oven to 425� and rub two rimmed baking sheets with olive oil. WonderHowTo Vegetable Recipes How To: Cut Potatoes into 1/4 Inch Batons for French Fries How To: Cut potatoes How To: Make Camote Fries or Sweet Potato Fries for Breakfast Be the First to Comment Share Your Thoughts. You Login to Comment. Click to share your thoughts Hot; Latest; How To: Prepare homemade hash browns How To: Baton vegetables How To: Make Pakistani style urad �... Peel the sweet potatoes, if desired, and cut into 1/4-inch strips. In a large bowl, combine sweet potatoes, oil and salt; with your hands, toss to coat. 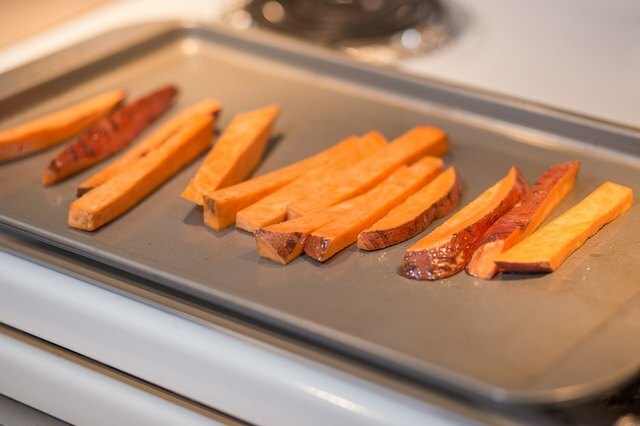 Spread sweet potatoes in a single layer on racks or foil without crowding; set aside remaining sweet potatoes. Cut a thin slice off one side of your potato so it can lay flat on your cutting board. Lay the potato face down on the side you just cut and begin cutting lengthwise every ?�. Peel and cut sweet potatoes into 1/2? fries (try not to make thinner, or thicker) . Soak in water for minimum of one hour. Soak in water for minimum of one hour. When ready, drain water from bowl and lift fries out by the handful.